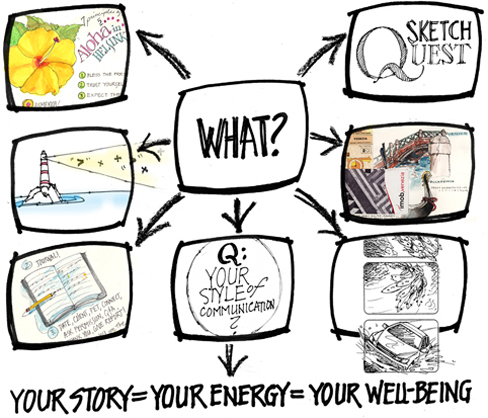 SHOW your story; your events, communications, teachings, ideas, with quick sketch “snap shot” picture storytelling. A quick, powerful visual way to discover, develop, promote, and communicate key ideas, solve problems in an energizing “outside the box” form: ignite and illustrate the heart of your “big ideas” and unique experiences. Now 80% of retained info is from pictures. SHOW your ideas to the visual majority! • Exclusivity, making your ideas, group, audience, feel special and included! • A visual catalyst for clarity, productivity, focus, during and after events, programs, retreats, and presentations…and much more! 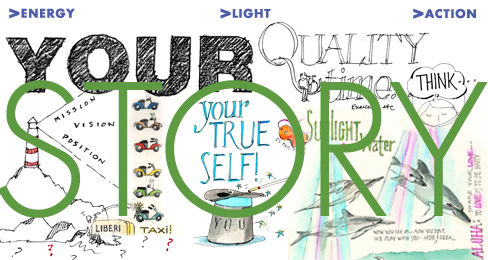 Chi-Lightful Sketch offerings tell story for both individual and group meeting: CHI-LIGHTFUL INDIVIDUAL SKETCH QUESTS: Quick black and white sketch visual “story finding” consultation sessions for C-Suite gatherings and Individual discovery. Session visual reports can be used as a “now marker” tool for many topics from communication style to achieving leadership goals. Consultations available for direct clients and for facilitation partners.